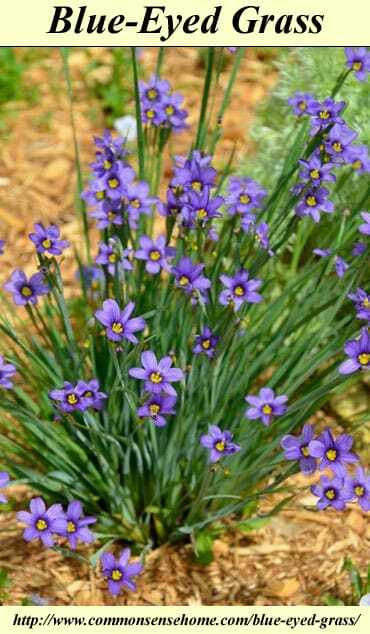 Today’s featured plant is Blue-Eyed Grass, Sisyrinchium montanum. There are many varieties of blue-eyed grass, that look somewhat similar to each other, but the one I'm discussing in this post is also known as Strict Blue-Eyed Grass, Mountain Blue-Eyed Grass, Common Blue-eyed grass, little blue-eyed grass, little common blue-eyed grass, alpine blue-eyed grass, northern blue-eyed grass and Star Grass. (source, source, source). This “grass” is not really a grass at all, but a type of beautiful, delicate iris. Narrowleaf or stout blue-eyed grass (Sisyrinchium angustifolium) is another variant. Wikipedia notes that this genus includes 70-200 species of plants in the Iris family native to the Americas, some of which are endangered. I first discovered these bright little gems while snapping some photos on the neighbor's hunting land after they had let their grassy area get a little taller. It always pleasantly surprises me when I discover a “new to me” plant even though I've lived in this area for years now. I later found some plants in my own yard, but my husband keeps mowing them off even after I pointed them out. 😛 I need to find a safer spot to relocate them to, but it's rather pretty to see tiny blue flowers popping up in the grass. We had a very wet spring, so perhaps that's why I'm seeing more of them this year, since they prefer moist conditions. In addition to yards that are not immaculately groomed, you can find blue-eyed grass along roadsides, and in meadows and prairies. It's easy to see how my husband missed this in the lawn. The plants themselves are small, and their fine leaves can easily pass for lawn grass. You can see a little bit of darker brown color at the base of the plant in this photo. 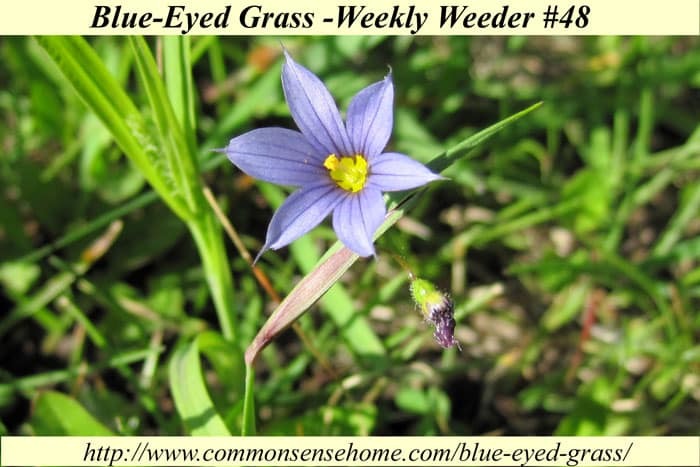 Blue-eyed grass plants can reach 4-20 inches (10-50 cm) tall if you don't mow them, like the gorgeous plant featured at the bottom of the post. My friend, Tami, graciously shared that photo from her flower garden where she is cultivating a number of native plants. As perennials, once established, these plants spread by rhizomes and will come back year after year. Learn 2 Grow notes that the bright flowers attract butterflies and other insects, but no specific species were linked with the flowers. Wild About Flowers indicates that strict blue-eyed grass attracts birds (with the seed heads), bees, and butterflies. Montana Plant Life and several other sources indicate that the leaves are edible when cooked. 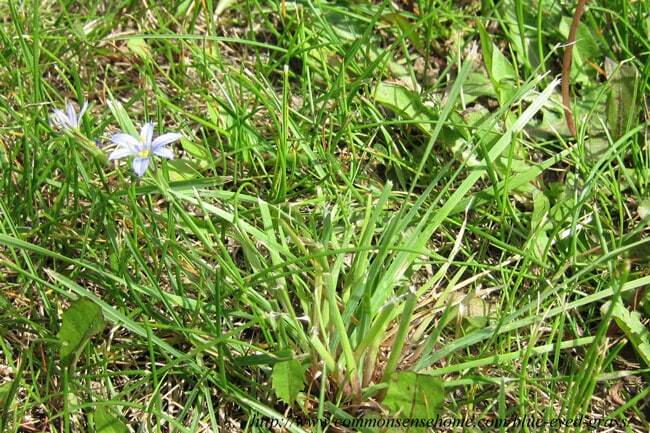 Native peoples used the roots of mountain blue-eyed-grass to make a tea for treating diarrhea, especially in children. A tea made from the entire plant was taken to cure stomachaches and to expel intestinal worms. Herbalists used these teas to treat menstrual disorders and for birth control. The plant has also been used as a laxative. I was unable to find more detailed information. As always, any medical information is for informational purposes only. Always exercise caution when using any wild plants and make sure you have positively identified the plant. Although rare, sometimes allergic reactions can happen, as will any food item or new substance you encounter. Please Like, Pin or otherwise share this post if you would like the Weekly Weeder series to continue. You may also enjoy other posts in the Weekly Weeder series. It’s beautiful, I have it, or, a close relative in my lawn in Rotorua New Zealand. Thanks, Elizabeth. It’s always fascinating to me how widespread many of these plants are. I have these all over my yard. I love them! Thanks for taking a moment to comment. What are are you in? I used to make beautiful gifts with pressed blue eyed grass as one of the main flowers when I lived in Texas.. They grew everywhere.. Wish I had a whole book of them now.. I’d love to make some more.. Its a sweet delicate flower and one of my loves..